Welcome back to my project of slowly reviewing all the coffee and cakes in Tallinn with my friend Greta, this week: a fancy cafe right in the heart of downtown. Review: Located in Viru Keskus and just steps from Old Town is Rahva Raamat, the largest bookstore in Estonia. Inside that bookstore is an upscale cake and confectionery, Gustav Gastro Cafe. 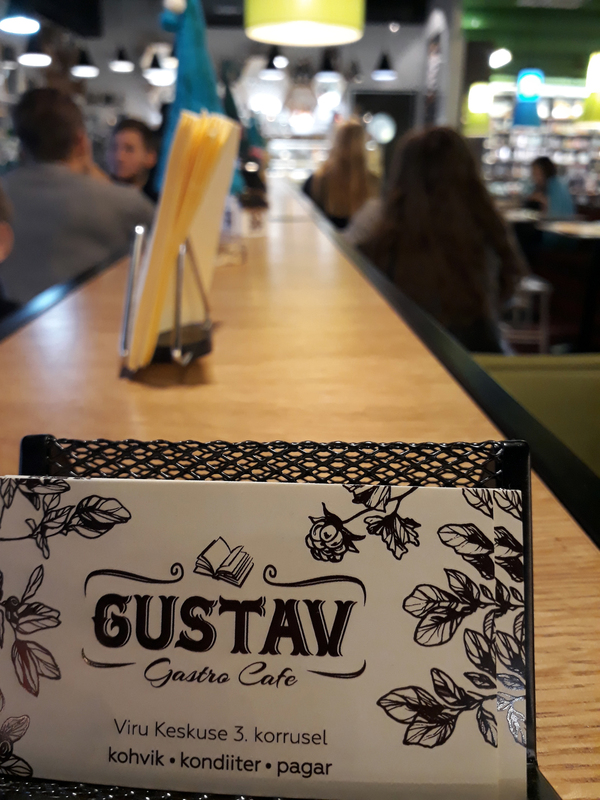 Gustav is a chain with 6 locations but this one can be reached from nearly any tram or bus. The cafe itself is easy to locate, at the center of the main level of the bookstore. It’s set up to look like a diner with ample variety of comfortable looking seating types. The atmosphere is great because it’s in a bookstore and they offer everything from breakfast and coffee all the way through plated meals and alcoholic drinks. Cakes, pies, truffles, and other confections line the counter including a surprising number of allergy friendly and vegan offerings. 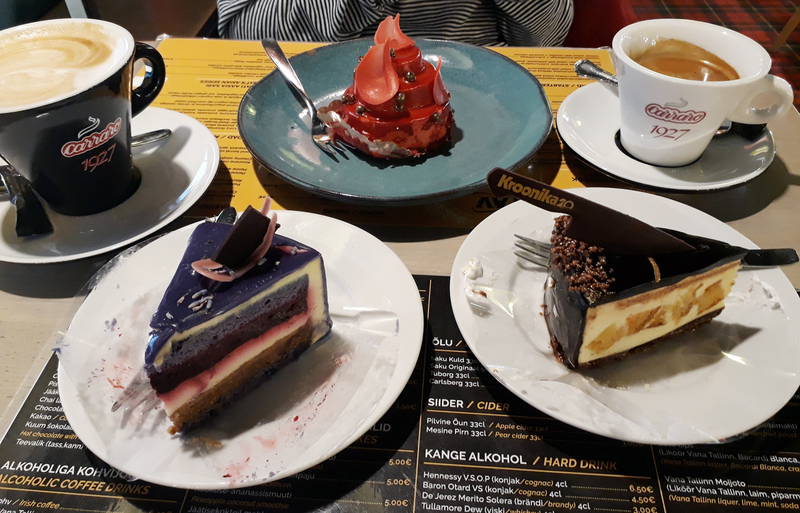 We received friendly service and though we carried our own cakes to the table ourselves, coffee drinks were delivered by waitress and dishes were collected at the table. 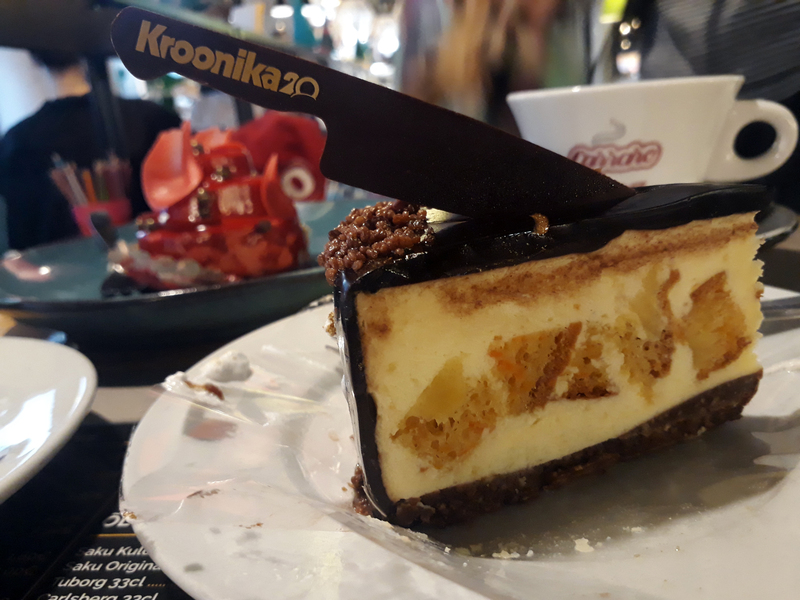 KROONIKA 20 Fine Cake „Scandalous Experience!“ is tropical flavored cheesecake with carrot and pineapple sponge pieces inside. Topped with a shell of soft chocolate and a chocolate knife because…why not? This was probably the best of three. The flavor was subtle but not bland and the sponge pieces gave the cake a good texture. Next up was the Lavender Crème Brûlée. 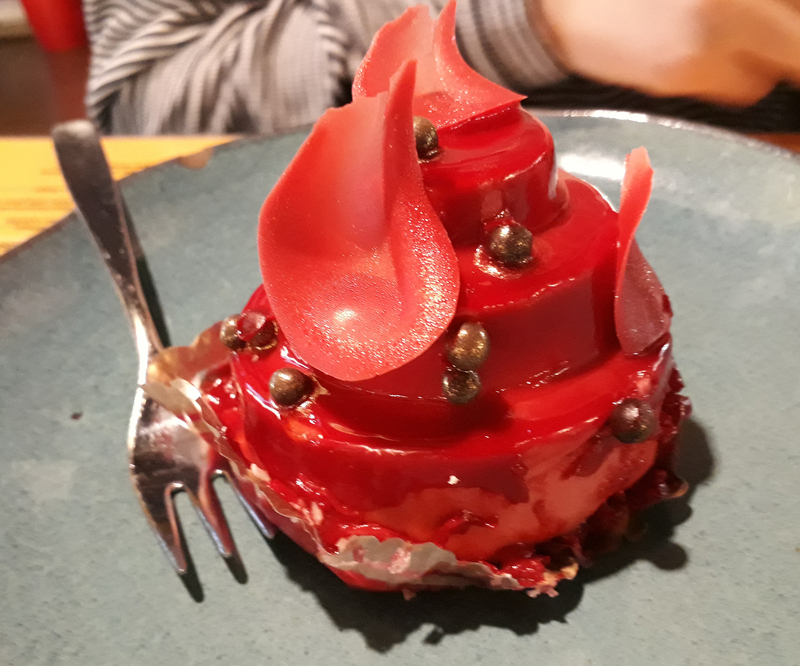 Their website gives a slightly different description of “Lavender sponge cake with Prosecco crème brûlée” which also doesn’t quite describe this cake. If I see the word “lavender” on a product I expect the item to taste like lavender. This cake completely misses that mark. 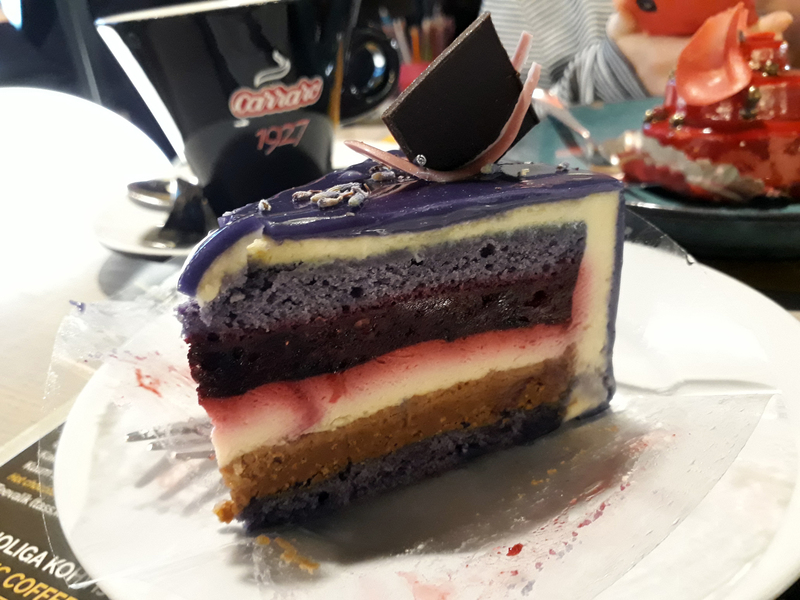 The “crème brûlée” portion of the cake tastes more like Butterfingers than prosecco and the other layers included a soft cheesecake and a berry layer was quite tart mix of blueberry, redcurrant, and blackcurrant. It’s not to say this cake wasn’t good. It was an okay cake, and actually at the end when I turned the cake on its side and ate each layer by itself, they were each delicious on their own. When it comes down to it this cake both didn’t live up to its advertising and was kind not a cohesive idea for a cake as it was actively unpleasant to eat as intended. So, this is cake number three. It’s shiny and red. What’s in it? We weren’t sure. The outside is decorated with chocolate petals and crunchy circles and the inside had three layers two mousses and a base of thin sponge that was nearly flavorless. 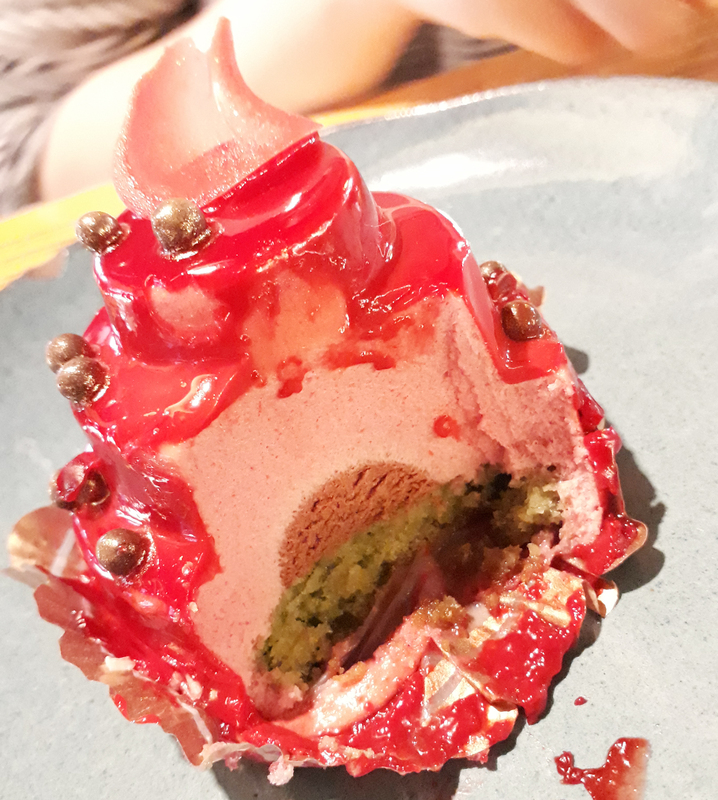 My best guess is strawberry mouse, currant mousse, and a sponge of matcha but since this tasted more like eating air, it was unsatisfying on many levels. The coffee at this location was slightly worse than average and they got Greta’s order wrong. The price was a little high but you’re paying for the confections and location so that’s be to be expected. I was really expecting to be wow’d by this place since everything was so beautiful but the cakes were good ideas executed badly or overly complicated flavors that weren’t pleasing to the palate. There are way better places to go for cake AND coffee within a few blocks of this location but if you’re here already, instead of cake you should grab a few truffles. Just make sure they double check your coffee order!